Official Preseason Balance Update 2 Patch Notes - TONS of Nerfs and Buffs! The long awaited OFFICIAL Patch notes have been released! Feel free to compare them with the PBE testing changes, it looks like a lot made it through, and they decided not to nerf Amumu's ultimate after all (in line with the latest PBE patch). 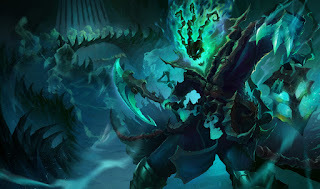 Thresh is still undergoing PBE testing, and will be released at a later date. Stay tuned for more information on the Chain Warden! Fixed an bug that sometimes caused Talon’s Rake to fire backwards after using Cutthroat. The cooldown indicator now more accurately shows when Short Fuse is available. Speed Shrine removed! There’s now a Ghost Relic in its place. The Ghost Relic replenishes 94-315 health and a small amount of your ability resource. It also grants a brief speed boost. The Ghost Relic spawns at 1:55 and respawns every 90 seconds. Bots are now more likely to use activatable items. Added Darius Bot to Co-op vs. AI on all maps. Fixed a bug where Shen Bot wasn't casting Stand United. Co-op vs. AI will now properly display as a co-op vs. AI match instead of a 5v5 pvp match. Seriously...I hate Amumu so much. A team with Amumu could be bad as hell but Amumu still destroys everyone with his ult in a teamfight. Additionally, Eve's ult nerf is way too hard...I can't understand Riot in this circumstances. The suggested ult nerf may have been too much too fast, I think they want to nerf his slowly into balance, whereas such a big change would have made people abandon him all together.